A variety of banana, with a reddish-purple skin, that is shorter and plumper than the traditional Cavendish banana. 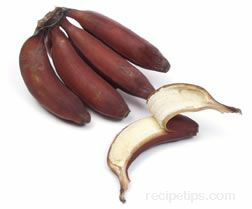 Raw red bananas have a flesh that is cream to light pink in color, providing a mild taste that has a slight raspberry flavor. Grown in South America and Asia, this fruit can be used in salads or fruit compotes, but is most often used as a baking banana. Bananas ripen naturally without being refrigerated, however by placing them in a refrigerator, the skin darkens quicker, but they are kept from becoming soft and mushy for a longer period of time. Red bananas are also known as Jamaican bananas.